Life of a Catholic Librarian: Crafty Tuesday is back with a veneance! As I write this, I am home from work with a sickly Anne. It is also the first day of spring. This combination means that spring crafting fever is back with a virulence in the Catholic Librarian household. It happens every year. Spring comes, and suddenly I cannot stop ordering yarn in pastel and Americana colors. You know, in preparation for 4th of July gifts. (?!) I start to crave cotton, and look at dishtowel patterns until I can't see straight anymore (look at these beauties!). I desperately try to find summer pullover patterns that are amenable to worsted weight cotton yarn, preferably in heathered hues (*swoons*). This one isn't too embarrassing, because I only started it in January, and look how fabulous it is!! 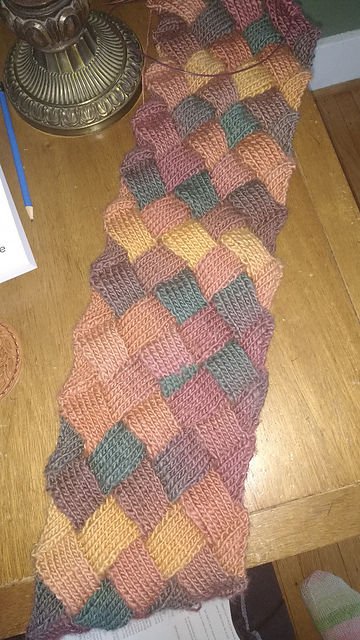 Entrelac is a fairly new technique for me, and I absolutely love how it looks. You need a color changing yarn with long repeats for entrelac, and the yarn makes it look like you changed colors for every square. Yarn that makes you look more talented than you actually are: this I can get behind!! AND, it moved along pretty swiftly for a scarf. With scarves, I usually start out all enthusiastic and get bored after about 5 inches of fabric. Great. Just 5 more feet to go. :0 When knitting entrelac, this doesn't happen. I keep getting excited to see the next square! Thus, I finished it and cast off this weekend. I know what you're thinking. Typical knitter getting a dreaded case of Second Sock Syndrome. Mike thinks that I made that term up, but let me assure you that this affliction is very, very REAL and that many knitters come down with a case of it. But not this one. Usually. Usually when I finish one sock I cast on right away for the second one. I mean, we have 2 feet. There is no sense in prolonging the inevitable and not starting the other sock. 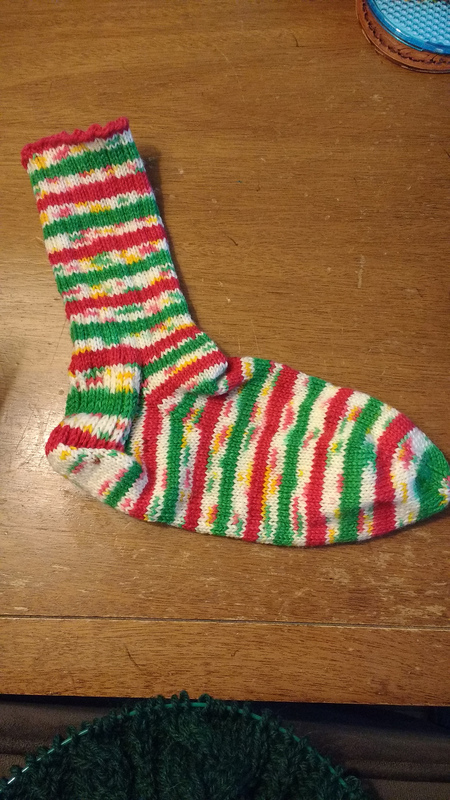 Despite the fact that you are now bored stiff by these socks and would rather knit a toilet paper roll koozie for your elderly neighbor, I try to avoid the temptation and just cast the second sock on. Well, around Christmas I fell off the wagon a bit. I knit this first sock for Henry while in the throes of red/green/white festive fever, and then got distracted by rehearsing my dance repertoire for New Year's Eve, and then look what we have: a lone Christmas sock in March. I'm happy to report that the second sock has now been cast on and has an in-progress cuff. This is my purgatory before the heavenly reward of a giant Easter colored Knit Picks order. This one doesn't *sound* as embarrassing, but let me assure you that it is. I started this dress LAST spring in preparation for LAST summer. Oy. As soon as I finish the Christmas sock, I need to pull this back out. And hope that it still fits her. Today will afford me lots of knitting time. I've got this. I hope. Are any of you feeling the spring crafting fever? I'd love to hear all about your ufo's as well as new spring projects. 😇 Don't forget that it's book club day tomorrow! I don't think this crafting project affliction is just related to knitting. A lot of my projects start out with me having an idea and getting supplies but never actually doing the project. Or starting the project and remember I still have it *years* later. In some of those cases, I just quietly use the supplies for something else that sounds more appealing and won't take so long to make. Your entrelac scarf turned out great. I love it when the yarn does all the work. I've made a couple of scarfs for gifts out of ruffle type yarn. They look great and the yarn does the heavy listing so they are simple to knit. I've been eyeing some yarn in purple shades to make an entrelac scarf for myself. However, I keep telling myself I need to finish some of one of my current projects first. I finished a couple of sewing wips this weekend. A new bag for storing Christmas decorations and hemmed a pair of jeans. I got the jeans on clearance over a year ago but have never worn them because they needed to be hemmed. On the plus side I rediscovered other pants in my closet since I didn't have a pair of jeans to wear. Your jean story made me laugh! 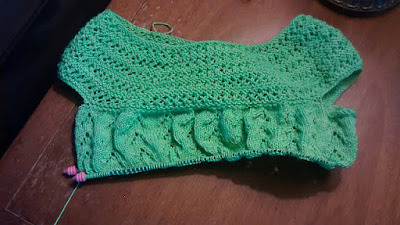 I also find that I am most productive in finishing up wip's when I am plotting another yarn order; lots of motivation! hee.